Whiskey (left) and Jeffrey Meyer love going to the park. There are many reasons dogs deserve to be called “man’s best friend.” In addition to offering loyal companionship, dogs provide a number of health benefits. The mental health benefits of dogs have been well documented. Taking care of a dog — feeding, walking, grooming and playing with her — provides daily structure and a sense of purpose that can reduce depression. Taking a dog outside for walks and bathroom breaks on sunny days gives you several daily doses of serotonin, the feel-good hormone. Exercising with your dog can reduce stress, improve your mood and reduce symptoms of depression. With their endless supply of unconditional love and acceptance, dogs make wonderful companions. Whiskey is one of those dogs. Like too many other pitbulls (and other breeds), Whiskey wound up in a full DFW-area animal shelter. The victim of a gunshot wound, she required extensive veterinary treatment that included having her left front leg amputated. Missy Redding, president of Bull lu vable Paws and Chi Wawas Rescue, thought it would take months for sweet tripod Whiskey, who had been used as a bait dog in dog fighting, to find her forever home. Even so-called “normal” pitbulls often take months or even years to get adopted, due in part to media portrayal of these dogs as vicious monsters. Her missing leg and understandable wariness around other dogs decreased Whiskey’s chances of quickly finding her forever home. Whiskey, who was supposedly slow to warm up to men, quickly bonded with Jeffrey and his family, who adopted the lucky pup a couple of months ago. Whiskey’s missing leg doesn’t slow her down or hold her back. Jeffrey and Whiskey go for leashed walks in the park, safely exposing her to other dogs to help her overcome her fear of being attacked. They also play fetch together. Whiskey is truly an ambassador — both for her breed and for tripods. Many people who have never met a pitbull are quickly won over by a sweet one like Whiskey. Pitbull-type breeds (Staffordshire Bull Terrier, American Staffordshire Terrier and American Pitbull Terrier) score higher (87.9 percent across all three breeds) on temperament tests than 99 of the 126 breeds tested. Dogs, like people, should be judged based on their behavior, not their appearance. Meyer is proud of Whiskey’s role in creating awareness and educating people about limb differences. When people first see Whiskey, they pity her (“that poor dog only has three legs.”). When they see her walking at the park, they quickly realize she is just as capable of getting around as a dog with four legs. Conversations with Jeffrey initially focus on Whiskey but sometimes segue into a discussion of Jeffrey’s limb difference. When that happens, Jeffrey has an opportunity to educate people about limb differences. Jeffrey is all too familiar with people’s misconceptions about the abilities of people with physical differences. He’s had to prove himself to people throughout his life, particularly employers, who doubted his capabilities because of his limb difference. 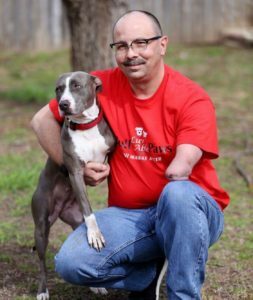 Jeffrey considers his limb difference to be “a gift that may inspire others who are struggling with their own setbacks and differences.” Jeffrey and Whiskey are showing people what’s possible.